Marfan syndrome and some related disorders can affect the eyes in many ways, causing dislocated lenses and other eye problems that can affect your sight. Except for dislocated lenses, these eye problems also occur in the general population, which is why doctors do not always realize they are caused by Marfan syndrome. It is important to know that, even though these problems occur in the general population, they are much more common in people who have Marfan syndrome. What are the common types of eye problems in people with Marfan syndrome? What are the considerations for vision problems in children with Marfan syndrome? How are the common types of eye problems treated in people with Marfan syndrome? How do you handle emergencies such as retinal detachment? 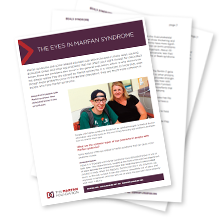 Find these answers and more in the "Eyes in Marfan syndrome" download.